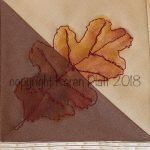 Autumn is well and truly here and last week I finished the new autumn quilt, so it is already to launch. 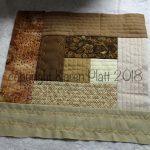 If you do not have the pennies to buy a finished quilt, I have also created a new quilt tutorial to go with this new design. All the work has been designed by me and I created the quilt myself from scratch. I set myself a few headaches along the way, but solved them so that when you use the tutorial, you will not have any problems. I had so much fun designing and making this quilt and know that you will too. 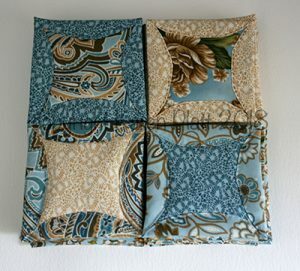 It is my first quilt pattern for sale on the website. The quilt itself is for sale on the website. 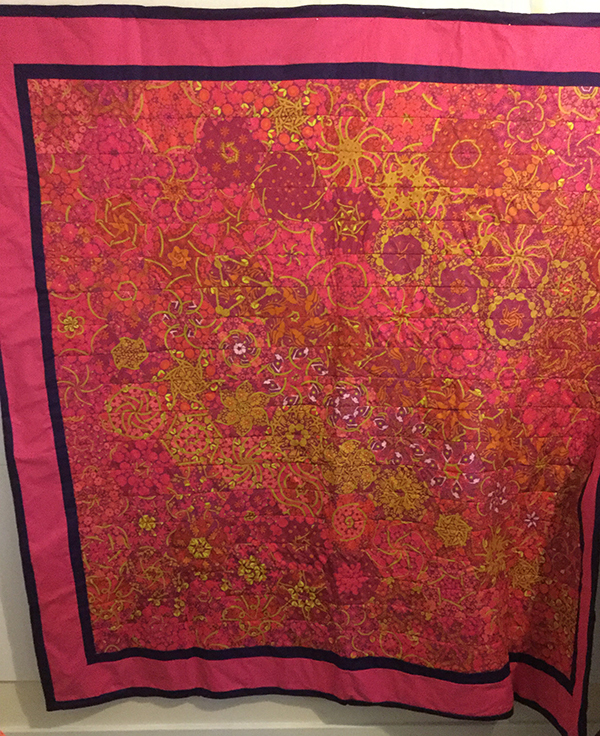 It is a one-off unique sample quilt I made, so there is only one – grab it while you can. 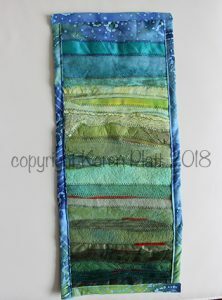 I have also designed and made a new landscape quilt. 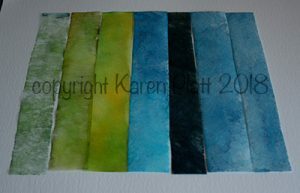 I am loving the colours of this one, called ‘Pebbles On The Beach’ and the original is on sale here. 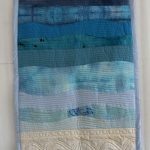 You can find my methods for making this type of quilt in my landscape quilt tutorial. 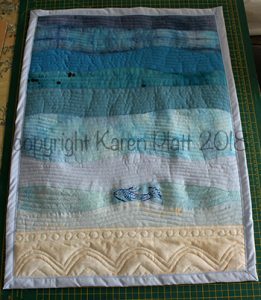 The quilt that I made for that tutorial is also for sale here. 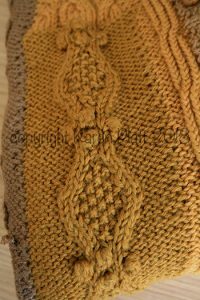 I have still to write my knitting pattern up, and will be uploading several patterns to Ravelry shortly. Meantime I am also working on a new Inspiration book – Autumn. The Churches Inspiration book is finished but waiting for me to finish off the textiles. Keep checking back and meantime why not check out the existing Inspiration Series? So much to inspire for art, textiles and more. These are all manual downloads as pdfs so that you can enjoy the photos. So much to keep me busy. Am I doing anything else? Yes, I found an embroidery I started some months ago – that will be finished soon too. How great is that? 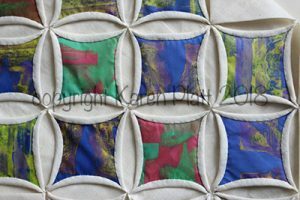 This is a new style of quilting skill builder – one where you learn whilst quilting. This new pattern actually involves 12 skills and once you have mastered this one, there will be more patterns to enjoy with different skills. Because you are learning along the way – the pattern can be used in different ways. 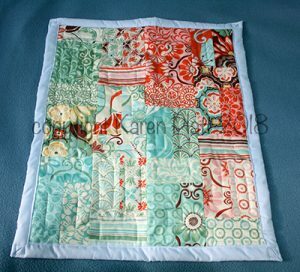 It also presents many options and variations for the quilter. Patterns can be found on the pattern section of the website. 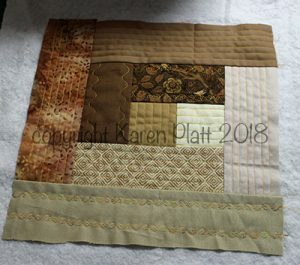 I have been developing this new style of quilting for a year now. 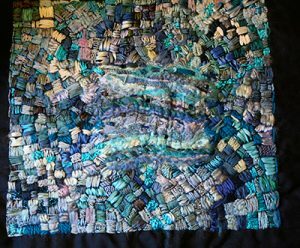 I’m hoping it is going to make a lasting impact on the quilt world. It should make it easier for beginners to achieve good results from the beginning and give them the confidence to build their skills quickly. 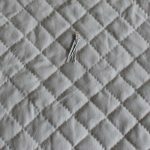 For intermediate quilters, it offers a challenge to the established method of quilting and even advanced quilters might find a skill they have not yet tried. 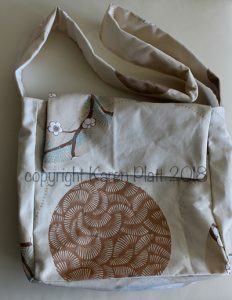 This latest design concentrates on autumn (fall) in theme and colour. This will be available as a pattern and tutorials. The next design will be for spring. I shall be offering a special pack, launching exclusively on the website, for everyone who wants to join in and make the quilt. It’s been a challenge to find a way to describe this new slant on learning to quilt. I have settled on the abbreviation QUILTSKI for Quilt Skills, to describe my methods. I do hope you will join me in this exciting adventure launching this week. 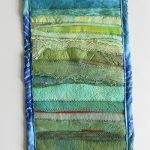 I know so many traditional quilters, but modern quilts are so very interesting, not only from an artistic and design viewpoint, but also that most of us live in modern homes and these quilts fit better into our lifestyles. 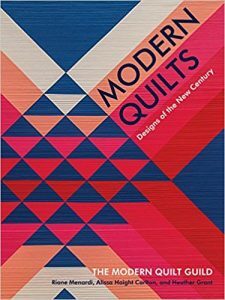 Subtitled ‘Designs of the New Century’ this book reveals modern quilt design. It explains the role of the Modern Quilt Guild and showcases some of the best modern designs. 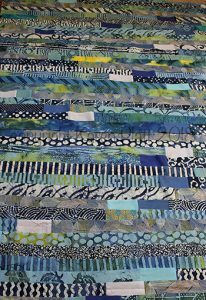 The history of modern quilting is tackled in chapters dealing with the stages: Before 1998; 1998-2004; 2005; 2005-2008; 2009 each highlighting key years and developments and finally the movement becoming mainstream. It’s a brief written history, fabulously illustrated with incredible quilts. That’s the focus of the book – the quilts. You’ll see simplicity, minimalism, deconstruction, blocks, text, colour, early improv, geometrics, pictorials and much more. No patterns, no how-to, just visual delight tracking the early beginnings of modernism right up to today. Subtitled ‘Easy Patchwork Projects To Give Or Swap’ this book is just that. A compilation of useful projects to use up scraps. Pouches, potholders, purses, baskets, keyrings, bags of all sizes – all with one thing in common – colourful patchwork. 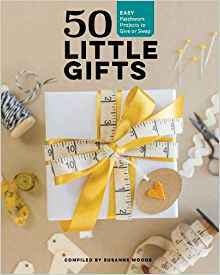 The projects are from different designers, and many are the usual organiser projects, mats, baskets, zipped purse and so on, but this book brings 50 such projects together and makes a super gift itself. Each project has a colour photo – clear instructions, with an at-a-glance box of essentials showing Size, Materials, Cutting and Tips. There are clear line drawings where needed and mini tutorials. I like the triangular log cabin pincushion, patchwork dog and passport holder. 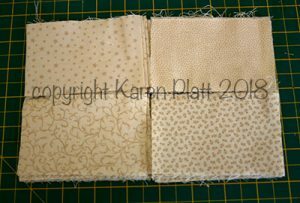 You’ll find a basic guide to embroidery at the front of the book and templates at the back; some are actual size, some need enlarging. Good patchwork fun. Retrospective of my quilting life so far. 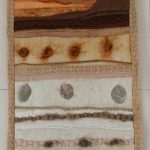 My professional quilt life began just 21 months ago but the retrospective goes back much further to my humble beginnings. I never thought of being a professional quilter. I don’t have any connections. Heck I could not even follow a quilting pattern, nor sew a straight line. That’s the very reason I know I can teach you how to quilt. I did it the hard way – I taught myself. I am a professional, fully qualified and experienced teacher. I had always been interested in making things. I still am rarely seen without knitting needles and have designed my own patterns since the early 90s. 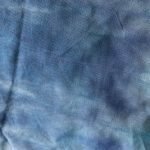 For the past ten years I have dabbled with hand dyeing yarn, threads and fabric. At the same time I became a self-published author of gardening books. I was very successful, particularly in the USA and Australia. I became a professional gardening speaker, speaking up and down the west coast of America. About ten years ago I went back to college to study art and design. Chiefly I wanted to learn to draw. The year before I had studied ceramics and fallen in love with it, but there was no way I could afford nor house a kiln. So I was thinking of doing fine art. 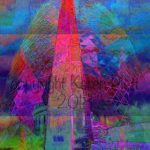 Then I became very interested in digital art and I have had some success in that field. I developed unique ways of manipulating photos. My interest in photography extends to decades ago. As does my interesting in painting and art. 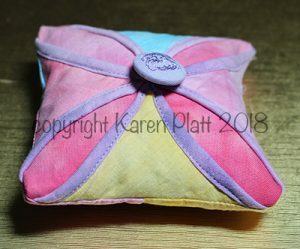 After that I took a morning course in Japanese Folded Patchwork and fell in love with this hand sewing method. I was developing textiles at the time but my interests have always been broad. In late 2011 I went to a stitch show and bought some fabric for quilting. I had no idea what to do with it. I eventually put it together for tiny pram quilts and made lots of mistakes. That was final then. I’d never make it as a quilter. 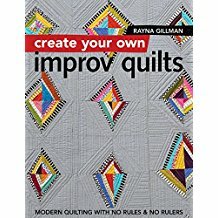 Quilting books completely baffled me. 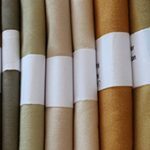 However I had not bought one lot of fabric, I had bought four lots falling in love with the colours. This fabric languished for some years. In 2012 I thought it was a shame not to use the fabric and started a quilt, but got stuck and it became a UFO. I continued to sell gardening books, paint and create digital art. I did an art residency. 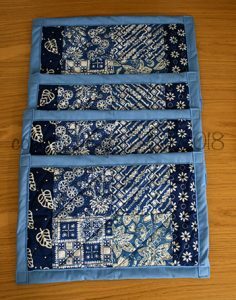 In 2013, I made four quilted place mats. I found them difficult to do and I forget how many hours they took me. I moved house and it became more difficult to dye. I was still living from the sales of my gardening books and had more to write. I lived in Tunisia for much of the time producing art and writing gardening books. I also wrote a book on Tunisian textiles. 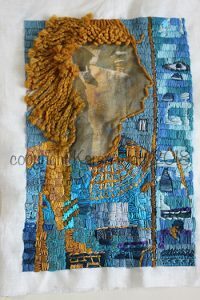 I was making embroideries and textile art and still do. My interest in digital art deepened and everyone keep saying the designs would make great quilts. I kept thinking, maybe, but I am no good at quilting. It was not until late 2015 I tried to quilt again, making a knitting needle holder. It was a hobby I was struggling with. I had at least three garden writing projects on the go. I was approached by a publisher to write for them also. I made a couple of bags and a couple of dresses. 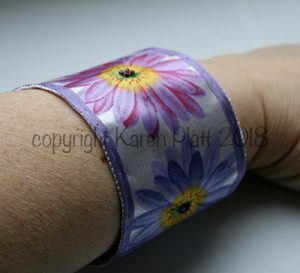 I would tense up every time I did sewing, waiting for something to go wrong. Dramatically in late 2016/early 2017 through no fault of my own, I was left without the means to earn a living. I was told my stock of books had been destroyed. I had no money to replace them. I took stock of what I could do, and my immediate thought was stitch. I set out to become a professional quilter. 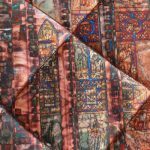 I learned to do Cathedral Window Quilting and wrote my own tutorials for quilting. I started to design my own stained glass fabrics for it. 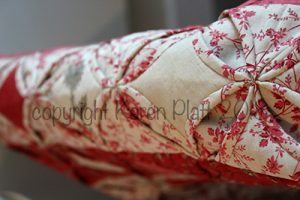 It was a slow process, being hand quilted but I was still so wary of sewing machines. 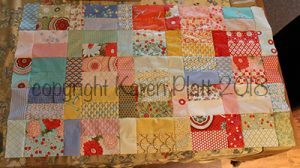 By March 2017, I taught my first quilting classes. I developed online classes for people to take wherever they live. 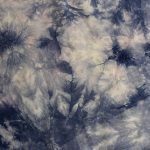 I moved into landscape quilting on the machine, designing my own quilts and writing up tutorials. I took the advice of friends and turned some of my digital designs into quilts also. 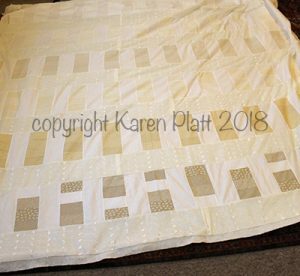 It was not until August 2017 that I finished my first bed-sized quilt, that UFO started five years earlier. I used my talents in design and colour to get me through. My challenge was mastering my sewing machine. I did and my latest design features free-motion sewing. Perseverance got me there in the end. I developed more tutorials and ecourses including design. 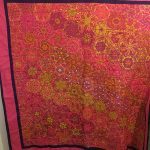 I challenged myself to make three kaleidoscope quilts this year, to prove that my skills are there. My next stage is to use my own fabric designs to continue my quilting journey with my own quilting designs. So there you have it a retrospective of my bumpy quilting journey that might never have happened if circumstances had not forced it. Design is still my driving factor but I don’t hate sewing any more, I have embraced it. I don;t get stuck any more, I have perfected my sewing skills. 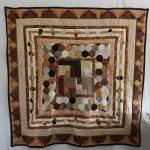 I am making quilts for sale. 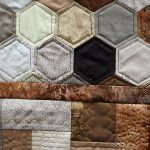 I did FOQ 2018 to dip my toes into the quilting market. 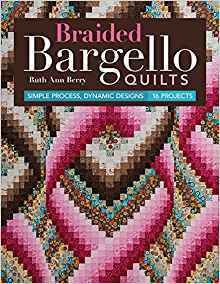 I have always loved Bargello needlepoint, so it is natural that I love bargello quilting. It can be a great use of colour, so I find it fascinating. 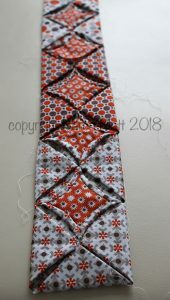 It is one of those fabulous quilt techniques that achieves a very complicated look, whilst not being too difficult to make. Braided Bargello takes bargello one step beyond, it’s like ordinary bargello with knobs on – knots, or twists and turns. There are 16 projects in the book from bed-sized quilts to smaller projects. 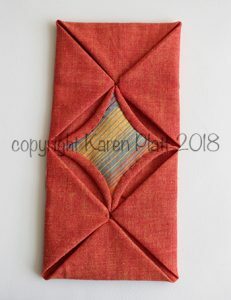 In Basic Bargello Construction, the author looks at fabric, cutting, designing and constructing as well as mitred corners. If you find the design chart in this section a little confusing, it becomes very apparent what you need to do if you look at the projects. All projects are accompanied by clear charts and easy to follow instructions. Interesting projects, but on most I wanted to make slight alterations as there are what I call stop lines to the designs – in very obvious places and I would wish to continue the curve. I also thought that many of the colourways were not to my taste. There is also a gallery of work. 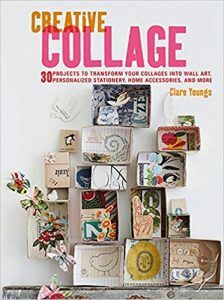 An inexpensive, informative look at paper collage using materials that are easily to hand. 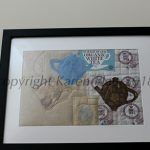 I love Clare’s choice of subjects, materials and the way she approaches collage. She uses scrap paper, fabric, magazines and photos to create her incredible artwork. The 30 projects are wonderful, I liked them all, and loved more than a few. This book gives you basic collage techniques. 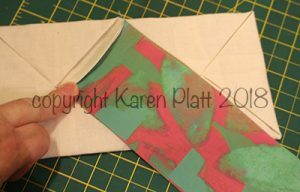 There is information on tools, techniques, how-to, composition, layering, stamping and colouring. This collage book is great for beginners. Make cards, pictures, notebooks, gift tags, journals and even home accessories. You will come up with your own unique artworks. Wonderfully illustrated throughout. I saw Clare’s work on social media and knew this was the book I wanted and it has not disappointed. Clare has a great sense of colour, layout and more, her work is inspiring. Find out how to start, create impact, use those pieces of paper – cut, copy,transfer and arrange. Instructions are general and can therefore be easily adapted to any size. It’s full of professional tips. The photos and line drawings make the projects easy to follow. Templates to enlarge are given at the back of the book – but why not make your own unique animals with your drawings? Use this fabulous book as a springboard. All the family could get together on these projects. I am happy to recommend this book. 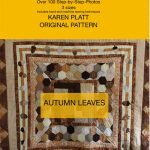 Subtitled ‘Modern Quilting With No Rules and No Rulers’this book shows you how to improvise to make modern quilts. It includes modern design, getting started, improvising in different ways, inspiration and a question and answer section. It’s all about cutting freehand, letting go of perfection, not following patterns but creating and experimenting. Rayna’s favourite two words are the maxim of many a designer ‘What if?’ In this book she looks at playing with shape. You’ll come to understand the way a designer’s mind works. It’s not quite 1,2,3, it’s more 1a or 1b, what if, oh yes 1c is better. 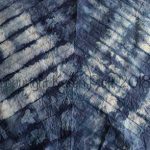 It’s about looking at possibilities and knowing which one makes the best quilt, or if you have enough ideas for a series. 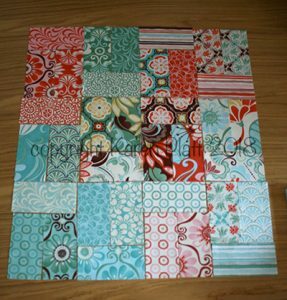 Includes Improv Paper Piecing without patterns, wonky blocks and even using leftovers. There is an inspirational gallery too. Recommended. 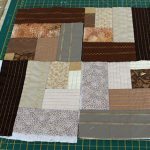 Skill building quilting in a row is designed to take you from beginner to expert. Each row involves different skills and techniques. 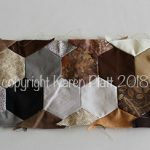 Sometimes piecing a quilt can become a little monotonous or even boring – with this method, you stay involved and interested because you are doing different things each row. 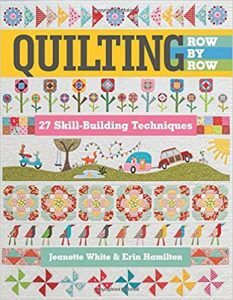 After tools and basic techniques, this book gets down to business, presenting 11 fun rows to quilt. Each row has full instructions and pictures. All the skills are seen in box, for example “using the 45°angle on a ruler”, or “accurate cutting”. 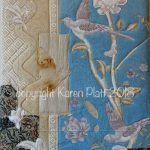 You’ll learn too many techniques and skills to mention in detail but amongst them are Dresden Plates, Pinwheels, Paper Piecing, On Point, Flying Geese, Machine and Reverse Applique, Sashing, Borders and Finishing. There are also two bonus quilt designs. Great skill builder and a lot of scope for injecting your own ideas.